Sierra and Steve were married just a couple weeks ago at Muir Beach and the nearby Pelican Inn. It was a really lovely intimate feeling day. They kept things relatively small with just their closest friends and family, about 40 people total, and you could truly feel how important each person was to the couple, and vice-versa. The Pelican Inn reflected that feeling perfectly. They took the place over and the entire building was teeming with activity throughout the whole getting ready process. 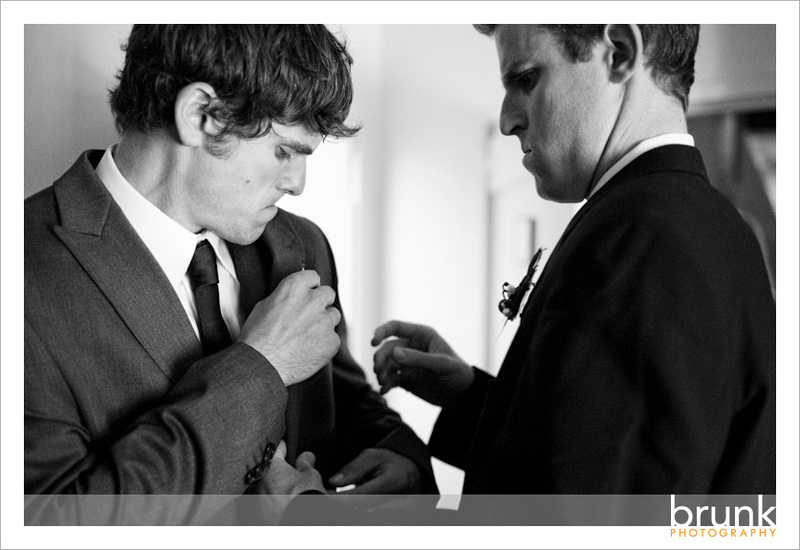 All the hotel room doors were wide open and people just flowed from room to room, tying ties, applying makeup, and affixing boutonnieres. It felt like one big family house, and one big family. Sierra also happens to be an extremely creative person, a talented photographer in her own right, and she created many of the wedding day details herself. It’s always flattering to be chosen to cover another photographer’s wedding, and it’s also nice because they know how important beautiful light is for the best possible photos. They know exactly where to sit when applying their makeup with the light pouring in from a small window, when to time the ceremony, and they’ll climb wherever I ask when they know it’s going to be an awesome photo. OK let’s jump in! Here’s that aforementioned awesome light that Sierra was sitting in to apply her makeup, love the yellow dress too! 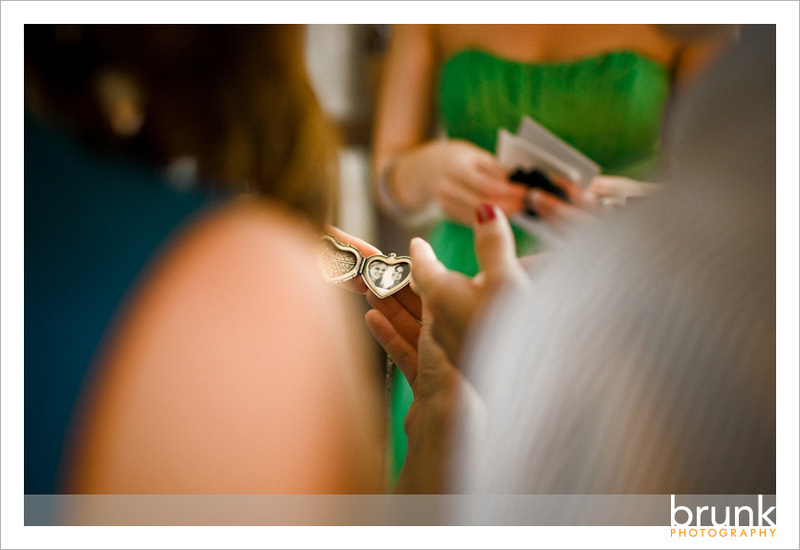 A gift from Sierra to her bridesmaids, a small locket with a picture of the two of them. I like the similarities between the woman in the foreground and the painting in the background. One last look in the mirror. I think she’s excited to get married! Some of the beautiful details of the day. Can you believe her Mom did the flowers? This was the longest wedding aisle I’ve ever seen. 🙂 It was about a quarter mile to the beach ceremony from the Inn, a beautiful walk. This is just as they crossed the hill to be able to see the ceremony site and Steve awaiting his bride. Steve’s Mom shedding a tear during the ceremony. Malarie climbed up the hill to get an overall shot of the ceremony/beach. Nice shot wifey! They were absolutely beaming at each other. Sierra and Steve react to a reading during the ceremony. One of my favorites. These 2 kids (not a part of the wedding) decided to check out the ceremony. They gave us a bunch of time for portraits, and they were of course timed for great light so we got some fabulous stuff. They look fantastic! These first 2 just might be my favorites. This is an absolute favorite too, the back of her dress was so cool, along with the hairpiece, and the free flowing feel of her hair. The toasts were all really heartfelt and touching, I like the emotion in this reaction. Really cool rings. I love the texture of Steve’s ring, and Sierra’s rings have been handed down in Steve’s family, and have so much vintage detail. Thank you so much Steve and Sierra for sharing this amazing day with us, we had a great time! We hope you’re having the time of your life in Costa Rica! Dennis Bullock - Fantastic work Cliff! Jyoti (mother of the bride) - Thanks for the wonderful pictures, Cliff. I love them. We really enjoyed your presence at this exciting and joyous celebration. I can’t wait to see the rest of your collection. Great job! Sage (sister of bride) - Cliff I cannot thank you enough. Pictures obviously mean a lot to Sierra, but they mean a lot to the rest of us too. Sierra was at peace knowing you were there to document her wedding. You truly captured the beauty of this day. Thank you for getting to know us! Your pictures are beyond fabulous! Can’t wait to see more! Hope you had some fun too! Much love to you and your beautiful wife! Sam Hanna - Just browsing your blog, the shots of Sierra & Steve are superb and the portrait images are excellent! Great mood and feel. Cliff - Thanks so much for the comments all! It was truly a pleasure being a part of a day like this one. marcy - Hi Cliff..thanks for becoming my fan. I am A HUGE FAN of your photography! I just scrolled the Sierra/Steve Pelican Inn wedding and I really got tears in my eyes..I have to say I think your wedding photography is the best I’ve seen. You get the moment and you get the composition and the lighting in all your shots! If I ever got married I’d want you to shoot it! Manus Chau - Great detail shots! Cliff - Thank you so much for the gracious comment Marcy! I’ve got a HUGE respect for you and your work, so that means more than you know!